Olov Johansson is widely considered Sweden's foremost exponent of the nyckelharpa. As a stunning virtuoso and as a member of the folkgroup Väsen he has contributed a great deal to the development of the instrument over recent years. At sixteen Olov started playing for Curt Tallroth, a renowned master musician from Harbo, and through him Olov has learned tunes from north Uppland which down the centuries have been played and passed on from one generation to the next. 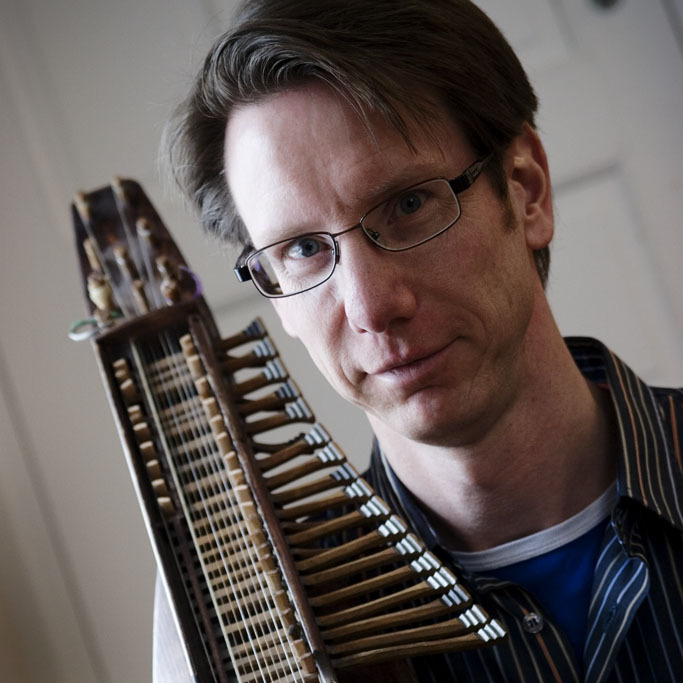 Olov has also played together with Eric Sahlström, the most prominent figure in nyckelharpa playing this century. Olov has won numerous honours and awards for his work as a musician. In 1984 he was made Riksspelman, a title reserved for the best folk musicians in the country; in 1990 he was elected World Champion of both traditional and modern nyckelharpa. Owing to the success of the folk-rock group Nordman, Olov's playing can now be heard in the homes of over a million record buyers. In 1997 he became the first Swedish folkmusician to have the honour of working with the internationally famous American string quartet, Kronos Quartet. Olov strives to pass on his musical heritage and has become role model for many of today's young nyckelharpa players. He teaches both privately and through the Royal College of Music in Stockholm. Some of Olov's pupils appear on the critically acclaimed CD "Till Eric" (DROCD006-1995). Olof has worked to bridge the musical gulfs between various bodies in Swedish folkmusic caused by generation gaps and geographical division. For Olof it has come as naturally to play together with traditional musicians like Curt and Ivar Tallroth and Eric Sahlström as it has to play modern arranged folkmusic with groups such as Väsen. On this album we can hear some of the musicians Olov has worked together with the last few years; Roger Tallroth and Mikael Marin from Väsen, Anders Bromander from the jazz group Trio con X, Claudia Müller and Mats Olofsson, whom Olov met through his work with Nordman.